Katy Robinson is a professional dancer, choreographer and dance and fitness specialist qualified to teach all ages and abilities in both dance and fitness. Katy has danced since she was 5 years old and became a professional dancer at the age of 18 dancing on cruise ships all over the world. Katy has been teaching dance from the early age of 16 and has been teaching fitness and blending the two since 2002. Katy trained at Constance Grant Dance Centre in Sheffield and was taught and inspired by the late Judith Silvester. Katy is qualified to teach in all IDTA branches and is CYQ Fitness Instructor qualified to Level 3. The definition of ‘fusion’ is the result of joining two or more things together to form a single entity. 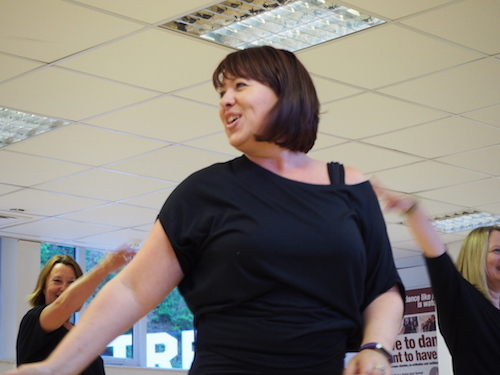 Fitness Fusion was born from Katy’s passion of dance, fitness and musical theatre fused together with her fun personality and experience of teaching both dance and fitness. Hi my name is Katy Robinson, Director of Katy Robinson Fitness Fusion Ltd and creator of ‘On Broadway’. We believe every woman deserves to feel confident, allow time for themselves and find something they love to do in order to get fit!Our team of passionate, experienced instructors use top hats, feather boas, canes and songs from all the popular Broadway shows, in local community venues that offer safe, non-judgemental classes for women of all ages, shapes, sizes and those with two left feet. We work with women of all ages who have a passion for dance! Ideally you are mid 40’s through to any age – you are never too old to dance. You may have had previous experience of dancing – be it as a young child going to a dance class or as a teenager doing it more seriously or as an experienced dancer, or you have always wanted to learn to dance but never had the chance. Typically you struggle with finding something you really love doing to keep fit that doesn’t seem like hard work and you may dislike going to the gym and doing the typical aerobic classes. You may feel intimidated in other classes and fear that you lack co-ordination, are un-fit, what if everyone is better than you and what if everyone is younger than you. You would like to improve your confidence, stamina and co-ordination whilst getting fit and having fun and be able to escape into make believe and have a little bit of ‘me’ time each week and meet like-minded women. What separates my ‘On Broadway’ dance classes from other adult dance/fitness classes is my background as a professional dancer, dance and fitness teacher and choreographer, fused with my coaches and I’s infectious enthusiasm, knowledge of musical theatre, passion for dance and fitness, combined with our ability to break down the most complex of choreography. As a result ‘On Broadway’ clients receive a unique dance class that enables you to have fun whilst getting fit doing what you love doing and a chance for you to reveal their ‘inner show girl’ and learn to dance like no one is watching! ‘On Broadway’ classes also incorporate positive mind-set techniques to promote health, happiness and wellbeing. They also include ‘Be Activated’ muscle activation technique to help increase flexibility and optimum muscle function. Making you feel at ease, providing you with a safe space to exercise and allowing you to relax and be yourself, havimg fun with like-minded women and creating a community is our number one priority. An increase in fitness, flexibility and co-ordination is a by-product and learning how to dance is a bonus.